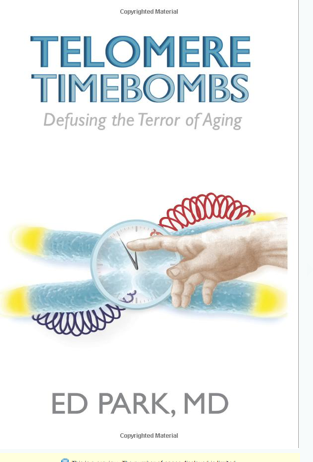 Blog Rave reviews for my book, "Telomere Timebombs: Defusing the terror of aging"
I found the book interesting as a guide to what has been happening to me, and to others. I’m 69, and have been taking 3 capsules daily for a bit over a year. For me, the most immediate effect of TA-65 has been better sleep and vivid dreaming. And after a while, I realized that exercise recovery is faster. Dr. Park’s description of the “upward spiral of health” is definitely true.One thing that caught me entirely off guard is that I had to buy new eyeglasses. The prescription for one eye improved from -2.5 to -1.5 in maybe 6 months. Of course it seemed like my vision was worse, and it was because the old prescription was no longer correct. Only time will tell if my vision continues to change, but I like the direction.The biggest criticism I’ve heard about TA-65 is that it is unproven. And in today’s world of drugs, that is a bad thing. Dr. Park explains that while TA-65 is new, the plant that it is isolated from has been used in Chinese medicine for thousands of years. It’s sort of Silicon Valley Bio-tech meets traditional Chinese Medicine. To read all the reviews, check out the link below. Thank you for all those of your who purchased the book! I am happy to report that I found an book agent and we will be pitching it to the big publishers soon. Let’s keep our fingers crossed for a larger platform!